It's already come to that point of the season where the first international break is upon us. It can be a strange period where many fans are frustrated due to the club football season coming to a halt just as it was starting. Growing up, there was no doubt, I too was also often annoyed, but since 2012 the emergence of my national team, Wales has actually provided excitement and interest. So why this piece? Easy, it is not just the men's game that has brought the Welsh - English rivalry to the masses. Indeed, on Friday the two rivals face off in one of Women's football's most anticipated clashes in years. In the past, we've written about the history of both the English and Welsh national teams, but this week brings the two together into a true rivalry. Currently, England sit 4th in the world with Wales at an all-time high 29th. It is a testament to the two side's glorious World Cup qualifying campaigns so far. Both unbeaten, with only 1 goal conceded between the two sides. A win sees Wales qualify, a draw would favour England and an English win would of course see them reach another World Cup. Welsh football history in general is one of near-misses. Of course, there are the anomalies in 1958 and 2016, but in between these are qualifications where a single goal or game has defined the entire campaign (1976, 1994 and 2004 to name a few). The women's side is no different. In 2014, they came agonizingly close to the World Cup only to lose 1-0 the Ukraine in their final qualification game. It was a group which also saw England win and a competitive rivalry begin. After so much historical negativity, the English women's team has seen success in recent years, coming third at the 2015 World Cup. Prior to this, they were often the source of frustration due to poor performances at major tournament. The head coach, Hope Powell had done an unbelievable job in promoting and inspiring the women's game in Britain, but couldn't quite find that winning formula at the subsequent Euros and World Cup. Testament to their recent success however has seen the names of Lucy Bronze, Toni Duggan and Steph Houghton as well known the nation's most celebrated female athletes. The Welsh team has been one of a far longer road to success, however. Until recently their record on the international stage was very poor - being as low as 56 in 2005. Amazingly, between 2007-8 - Wales recorded 9 defeats and one draw in their ten games. It's a record more reminiscent of San Marino, than potential World Cup qualifiers. Since then, under the stewardship of Jayne Ludlow, the side has rapidly improved with a wealth of talent like Jess Fishlock, Natasha Harding and Angharad James all excelling. Of course, this does little however to discuss the actual rivalry between the two. The rivalry of Wales and England in women's sport transcends football and has been seen as fairly tempestuous in hockey, netball and rugby. Perhaps any current animosity in the rivalry can be sourced to the 2012 Olympics. The tournament which was so successful in its promotion of women's football saw a team GB football team for the first time. However, the side saw no Welsh players but 16/18 English ones. "I had all the home nations extensively scouted before I chose the squad, Wales included. I sent Alan May over...to take to Jarmo. Alan asked him who he regarded as his best players. Jarmo just shrugged and said, 'all of them'." Powell goes on to note her understanding of the Welsh reluctance to join any GB squad. However she also writes that she didn't chose Welsh or Irish players because they weren't the best available. "We as a senior squad as well need more backing, absolutely, and so I think women's football in general in Wales needs a lot more backing. And it is unfortunate that we can't play in Wales [as professionals]... And the likes of Scotland and England - Scotland were not that far ahead of us - are now at least 10 years ahead of us, I would say"
Skip forward a few years and we reach the latest contest between the two teams a goalless draw dubbed 'Wales' greatest ever result.' For all of England's chances (22 in all), Welsh goalkeeper Laura O'Sullivan was equal to them. "We're still a developing team with areas to work on, but the commitment and work ethic tonight... it was Welshness," said Ludlow. 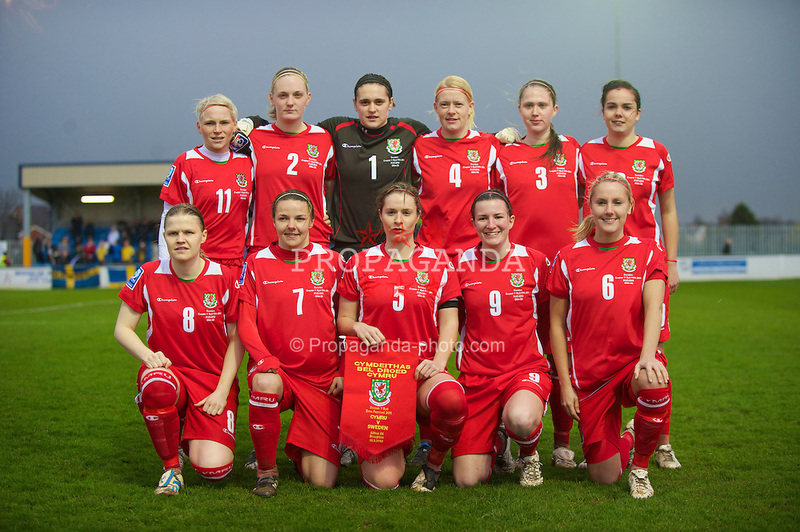 "From a female football perspective it's probably the best (result in Wales' history)." So what of the game ahead? England will no doubt be favourites. Despite the rise in Welsh football fortunes, you can't deny England's superiority on paper. Phil Neville will expect more of the same from his team, but under caution due to the resolute Welsh defence. Neville has already described the game as a 'grudge match', with former Welsh striker Gwennan Harries dubbing it the 'biggest game in our history". More of the same for Wales? "There is rivalry and tension and that shows how far the women's game has come. "There is a little bit of needle between both teams. Four years ago, we wouldn't have had this kind of build-up." What a game we have ahead! !